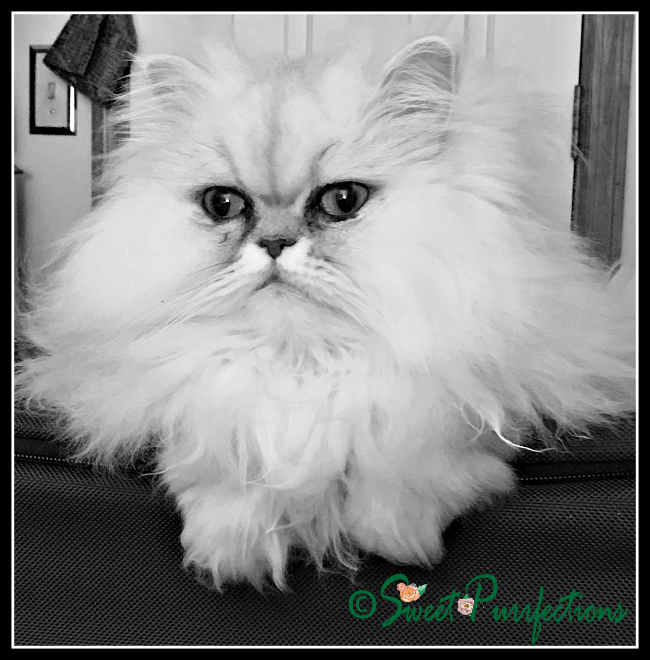 Brulee says it's time for her face to be featured on the blog since so much time has been devoted to her sister. However, Brulee wouldn't pose long enough for us to get a good and clear photo, so Mom Paula converted it to black and white. Truffle is feeling a little better. She still doesn't like the prescription food that she needs to eat, so Mom Paula is trying to mix it with some of the "old" food. Truffle eats around it and then goes and pushes Brulee out of the way to eat hers. She has to eat, so we're struggling along day-by-day. Hope Truffle feels better soon. Good to hear Truffle is feeling a bit better too. We love the black and white selfie. We hope Truffle gets used to her new food soon. Pretty black and white of Brulee! I don't know why kitties never like the prescription food - every time my human has tried one of these on Binga, or Sparkle before her, they've been total duds. That is very pretty Brulee! Poor Truffle, changing food is such a difficult thing. Brulee, you look great in black and white! Great shot, sweet Brulee. We sure hope Truffle learns to like that food. Purrs. OOOH TRUFFLE. You little minx!! You need to eat your proper food. That said, I do my best not to eat the food mum gives me. It drives her nuts.